This little quilt started out as another test. I wanted to try out a different free motion quilting design, and a baby quilt is a good size for me to try something new. Plus, it has the added benefit of using up more of those batting scraps I have laying around! 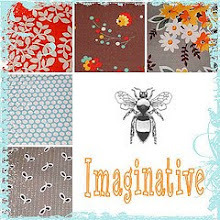 I used 2 charm packs of the lovely Wonderland fabric line – love those scissors! I simply sewed all the squares together and then backed it with this nice, slightly iridescent orange fabric from Joelle Hoverson’s Net of Jewels. I gave it a try on this quilt and I wasn’t loving the look. It might be because I had white thread in the bottom bobbin and it was REALLY noticeable on the back. I had about 9 blocks covered with this quilting when I decided I’d had enough. Of course, I really didn’t want to have to pick it all out, so I almost changed plans completely and changed it into a quilted bag, but honestly, I already have way too many bags! So I spent hours (yes, hours!) picking out all the quilting. Then I redid it with just simple straight lines, 1/4″ away from each seam both horizontally and vertically. I used orange thread in the bottom bobbin and cream for the top, and it looks much better. I suppose I’m glad I took the time to do it (despite all those wasted hours!) – now that it’s washed and dried, it’s a really cute baby quilt! This entry was posted in [search] Charm Quilts, 2009 Finished Quilts, Finished Quilts, Household Sewing - bags, napkins, pillows, Posts about Quilts, Quilts and tagged baby quilt, Fabric, handmade, quilt, quilting, wonderland. Bookmark the permalink. Adorable baby quilt! Ouch! hours ripping it out! That must have been painful. I love it! I love the quilting you settled on. Really makes the squares pop out. 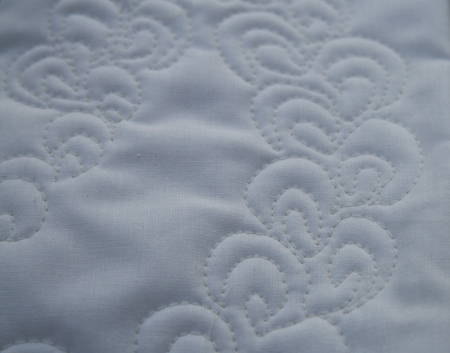 I am working up the nerve to do my own machine quilting from now on. Got any advice? I really love the quilting with the strong geometric lines. I am continually amazed at the speed at which you crank things out! That is a gorgeous baby quilt! Wow, I can’t beleive she voluntarily parted with all that Heather Ross! Those are so in demand right now. Crazy! Wow, what a pretty quilt! I have that charm pack too, and now I have a great idea about what to do with it! Thanks for the inspiration. 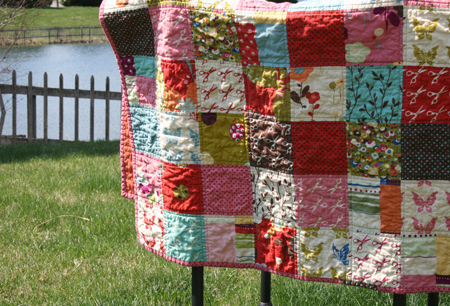 love the baby quilt, love the simple way you quilted it, it looks really great! Love the quilt, those scissors are my new favorite!! That Munki Munki is to die for. I really like how you ended up quilting this. Sometimes I find the simple lines make things pop and this is GREAT! I remember quilting a big quilt a few weeks back and what took 20 minutes to quilt took 2 hours to unpick. Ugh! If only we could get it right the first time! 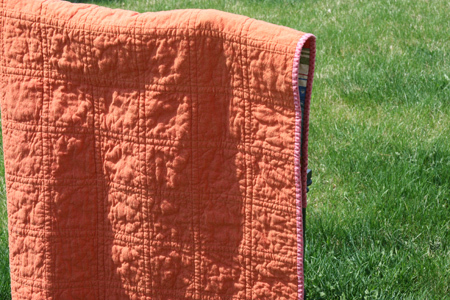 I love the simple squares and the quilting. another great quilt. you are my quilting hero. I can empathize with you on the quilting disappointment. It’s so hard sometimes to get what’s in your head to come out the way you want. Kudos to you for undoing all that work! I love the way it came out. Nice fabrics. I also love Heather Ross’s bundle of cuteness you rec’d. Now I don’t feel like the only one who picks out stitches! I just had to do it with two quilts myself. I love the way your quilt looks! I am currently in love with Wonderland, and I love your quilt! It is such fun, happy fabric:-) I don’t actually own any, though…I am afraid if I did, I wouldn’t want to cut into it… 🙂 Thanks for the inspiration! This is adorable. I too recenty experienced something similar. I had almost finished stippling a small baby quilt. I had been checking the back and thought it was okay. After taking it out of the machine I realized the white bobbin thread looked horrible and had to come out – 12 hours later I finished picking it out! I love those fabrics and the quilting came out perfect. It looks so snuggly! I love the finished quilt and although unpicking would have been a nightmare it looks like it was worth it. So much nicer with the straight lines. Wow, two quilts without white? You’re on a roll! What a beautiful baby quilt! And I admire your machine quilting skills. At this point I don’t have a walking foot for my machine so it’s hand quilting for me. I look forward to being able to learn to machine quilt. And I love your string quilt tutorial! I recently learned how to make these blocks…so fun and fast! 🙁 for some reason my comments I left before didn’t show up! What they basically said was: I love this quilt so much that I immediately went online and bought Moda charm packs, including the wonderland one at Etsy! Yay, they’re so beautiful! My first charm packs ever, you’ve inspired me! I absolutely love your quilt, and think I may do the exact same thing. I’m still wheeling up the courage to do a whole quilt and the charm pack seems to be the way to go. 🙂 Thanks for inspiring, as always. 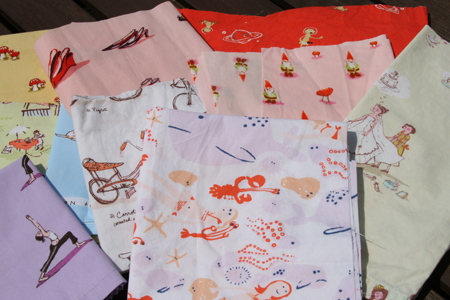 So, what do you do with all these baby quilts? Do you sell them at all? Just asking, in case I am in need of a baby gift for a friend. BTW, Sally still loves her quilt! She is wrapped up in it a lot! 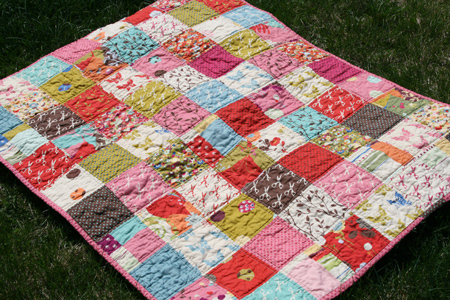 loooove the baby wonderland quilt! great job! this is wonderful…i love it! i have a few non-quilter questions: do you do the quilting and then add the binding? and do you prewash your fabrics? thanks! Thanks Kalle – Yes, I quilt the quilt and then sew on the binding. The binding is machine sewn to the front, then handstitched around to the back. I do not prewash my fabrics. Hope this helps! me again…sorry to be a pest; i have gotten the first 4 rows of my quilt top pieced, and for some reason (obviously, something i did wrong) the seams on the first 2 rows didn’t line up ‘perfectly’. is this going to create a huge problem for me down the road? it’s not awful, just a few are off. i plan to use the same quilting you did, 1/4″ off each seam on either side. thanks! 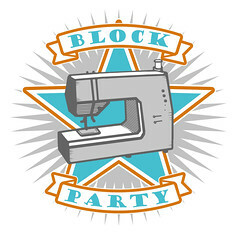 Pingback: Summer Wonderland « Craft Ahoy! I am a brand new quilter and am IN LOVE with your quilts! They look so comfy and soft! I was wondering what kind of batting you prefer to use. Thanks so much for the inspiration! this type of quilt were originated from China/Chinese, where in old times, town folks visit door-to-door to ask for one small piece of cloth, after gathered around 100 pieces, they started to make the quilt for the new born baby. and the quilt is called “100-household cloths” which believe having the blessing of 100 household family.